Art Department have released a brand new video for the single, ‘Cruel Intentions’ feat. Seth Troxler, the first track to be released from the duo’s forthcoming sophomore studio album, Natural Selection’. Pete Tong premiered the single on his BBC Radio 1 show on 17 October and since then it’s garnered further love and support across the network from Zane Lowe and Skream. ‘Cruel Intentions’ is a brooding whirlwind of hypnotic beats, layered synths and off-centre vocals courtesy of Kenny Glasgow. The video is a portrayal of "life on the road", depicting the seedy underworld of crack hotels and the contemptible morning-after realities. It was shot in Toronto and directed by Grandson & Son who used thermal imagining and X-ray film to "go beyond the bones" and capture people skinless and transparent on film, exploring the human structure as compositional device: "I love how the infrared photography imparts surreal effects when you reverse it and the subjects skin turns black." 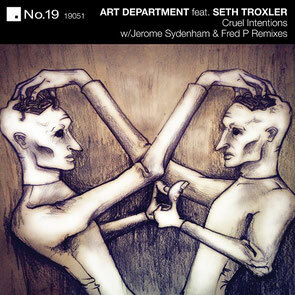 The track showcases Art Department's signature arrangement; simplistic perfection, distorted through a murderous bassline and raw textures, topped with hauntingly eerie spoken word verses by long-standing friend and collaborator, Seth Troxler, who also features in the video. The track’s out now, check the video below.